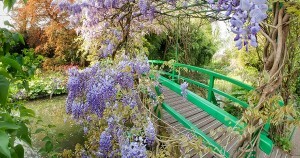 Claude Monet’s gardens at Giverny are like his paintings, brightly colored patches that are messy but balanced. Why not escape a day from Paris and dive into the nature of these fantastic gardens organized by foundation Giverny Monet. In 1883, middle-aged Claude Monet, his wife Alice, and their eight children settled into this farmhouse, 50 miles west of Paris. Monet, already a famous artist and happiest at home, would spend 40 years in Giverny, traveling less with each passing year. He built a pastoral paradise complete with a Japanese garden and a pond full of floating lilies. 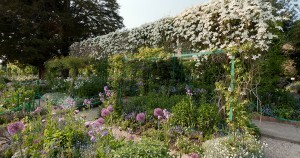 Now a lot of gardeners work steadily to keep alive and preserve all the vegetal patrimony. 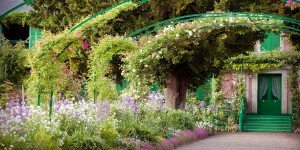 The Giverny Monet foundation have allowed the Claude Monet’s house and gardens to become a fantastic visitable place where you can find a wonderful and peaceful environment, unmissable for tourists travelling Paris and France. Visiting the Marmotan and/or the Orangerie museums in Paris before your visit here heightens your appreciation of these gardens. THE CLOS NORMAND: Before Monet settled in Giverny, the “clos Nomand” was already a small garden with a path conducing to the house. Monet embellished it transforming the area into a extraordinary location, reproducing some trees and growing new plants. He made it the garden of his dreams. THE WATER GARDEN: Monet had always attracted by plays of lights. He bought a piece of land close a small body of water which has become the water garden. Thanks the construction of a Japanese bridge and the use of Japanese plants he recreated the oriental atmosphere. Many times Monet has been inspired by this unique place for his paintings. 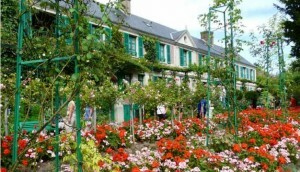 MONET’S HOUSE: The place where Monet lived, worked, and with his wife brought up 8 children. Visit all the rooms and let yourself imagine their past life. 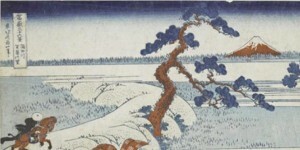 THE JAPANESE PRINTS: The passion for Japan led Monet to produce a unique collection composed of forty-six prints completely inspired by Japan people and places. THE WATERLILY STUDIO: It is a shop opened from the 1st of April to the 1st of November, every day from 9:30 am until 6:00 pm. To remember your visit to Giverny Monet foundation you will find many postcards, books, tea, posters, Daum rose vases, and sets of Champagne glasses to the official Monet tableware all based on Claude Monet gardens and works. 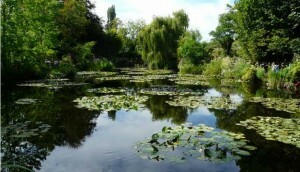 By Car: Drivers can travel to and from Giverny Monet foundation in a half day with ease. The trip is also doable in a half-day by public transportation with a train/bus connections, but because trains are not frequent (and less so on the weekend) be prepared for a full six-hour excursion. 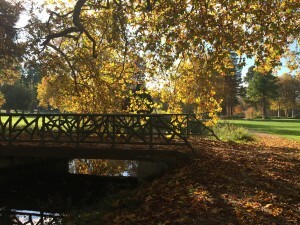 The area also features some picnic spaces. By train: The Vernon station is situated on the main line Paris / Rouen / Le Havre. It starts from the Saint-Lazare Paris station. The fastest trains complete the journey in less than 45 min. In the Metro, take the ‘SNCF – Grandes Lignes’ exit. Buy a ticket to Vernon. The Rouen line departs from the right side of the platform, in the ‘Grandes Lignes’ section. The Giverny Monet foundation is opened from 25th of March to the 1st of November 2016 from 9.30 a.m. till 6 p.m. – last admission 5.30 p.m. (Pets friends are not allowed). Furthermore the tours displayed below include the shuttle service. BOOK NOW The price includes: Minibus transfers to and from your Paris accommodation, services of our driver-guide, entrance ticket to Giverny, self-guided visit of Monet’s house, tour of gardens, self-guided visit at the Museum of Impressionisms in Giverny. Chateau de Chantilly is located 45 minutes by train to the north of Paris. 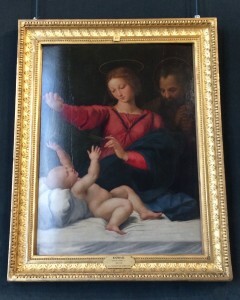 Complete with beautiful gardens and the Musée Condé which has the second largest collection of classical art in France. Chantilly is also home to stables with an equestrian museum. There was even a James Bond movie, A View to a Kill, filmed here in 1985. In short, there is a little something for everyone. The chateau de Chantilly was originally built in 1528 for the Constable Anne de Montmorency, unfortunately this chateau was destroyed during the French Revolution. The chateau that you see today was rebuilt by Henri d’Orleans, duke of Aumale, the 5th son of King Louis-Philippe, between 1875-1881. 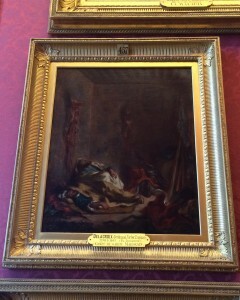 Henri d’Orleans was a passionate art collector and wrote into his will that the the paintings must never be moved, nor loaned outside of Chantilly. 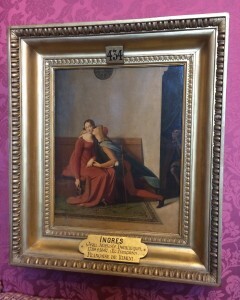 Meaning that the magnificent art collection that you see today is the same Henri d’Orleans enjoyed. Another highlight of the chateau de Chantilly is the vast gardens to explore. What makes these gardens particularly interesting is there are three different sections the French, the Anglo-Chinese, and the English gardens. The French gardens were designed by Le Nôtre, the famous gardener who designed those of Versailles, in the classic 17th century style. These gardens are landscaped in perfect symmetry, complete with fountains and are quite breathtaking to behold. The Anglo-Chinese gardens were added later in 1773. This part of the gardens is home to the hamlet that inspired Marie-Antoinette’s built at Versailles. The English gardens were born from the philosophy that the landscaping should be used to enhance natural characteristics, rather than bring order to them as in the French gardens. They also draw some of their inspiration from antiquity, so the English gardens of Chantilly also have a temple of Venus and statue of Eros, to give the gardens an romantic airs. If you visit Chantilly on a nice day I encourage you to take a stroll and enjoy the various designs of gardens. For art lovers Chantilly is a veritable treasure trove. 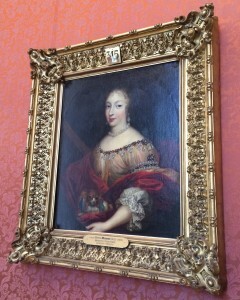 As mentioned the final owner of the chateau de Chantilly, Henri d’Orleans, was an avid art collector. Not only that, but he also collected rare manuscripts, one famous example being Les très riches heures du Duc de Berry. 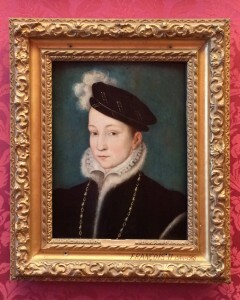 One detail that makes Chantilly’s collection interesting is the paintings are not necessarily organized, by style, so you have renaissance and realism paintings side by side. When visiting Chantilly you definitely want to leave plenty of time to wander through the hallways filled with art. It can be fun to play a sort of scavenger hunt to find the three works by Raphael, five by Poussin, five by Ingres, and three by Delacroix. The stables and horse shows is an element that makes the chateau de Chantilly unique from many of the other chateaux near to Paris that you can visit. The stables which are a genuine castle for horses is home to not only the stables, but also the Museum of the Horse. This museum is fascinating as it looks at the role horses have played in human civilization since their domestication. The 15 rooms the Museum of the Horse tells this narrative using old manuscripts, equestrian equipment, and works of art. 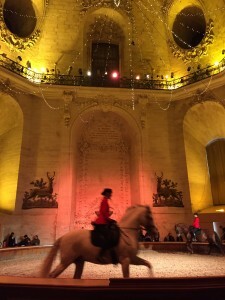 Another part of the stables is the equestrian shows and demonstration. These shows take place every day (except Tuesday when the park is closed) at 2:30pm. The show is about 30 minutes in length and the each show wows the spectator with the beautiful costumes, riding, and storytelling. 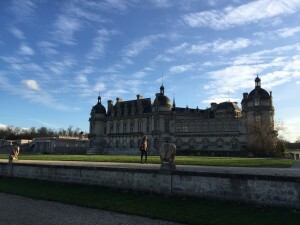 Check out our day trips from Paris here! Have you spent every minute of your Paris vacation visiting monuments, drinking café au lait, and riding the metro? Check out Disney World in Paris to take a break from the City of Light and let loose with Mickey Mouse for a day. Disney World in Paris is actually called Disneyland Paris. It is a Disney theme park located just outside of Paris made up of two parks: Disneyland Park and Walt Disney Studios Park. Disneyland Park, full of characters, rides, and street parades, is your quintessential Disney theme park. Walt Disney Studios Park gives visitors a Disney-behind-the-scenes experience. These are must-see, must-do attractions once you are in Disneyland Paris! 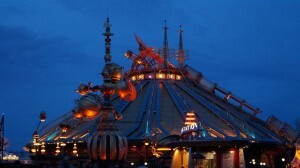 Hyperspace Mountain: Don’t miss out on this classic, futuristic Disney coaster. Mad Hatter’s Tea Cups: Don’t be late to take a spin in these brightly colored tea cups! Pirate’s of the Caribbean: Prepare to get splashed once you hop on deck. Dinner with the characters: Don’t miss your chance to eat with Disney characters at Cendrillon’s Auberge, Inventions, or Cafe Mickey. 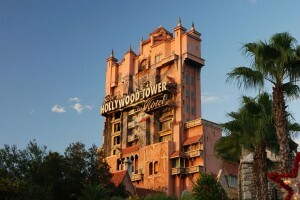 Tower of Terror: Climb 13 floors of The Hollywood Tower Hotel only to plunge back down in an instant. Rock ‘n’ Rollercoaster: Reach speeds of 57 miles per hour in just three seconds as Aerosmith’s music blares in your ears. Ratatouille: The Adventure: Follow Remy, the beloved rat from “Ratatouille,” to safety as you scurry through a giant kitchen. Armageddon: Experience first-hand how special effects work. 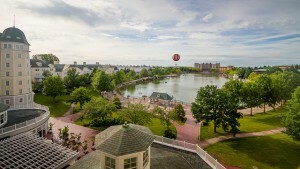 Although they may seem more expensive, Disney hotels are worth the price! Guests who stay at Disney hotels benefit from early access to FastPass cards, extended theme park hours, transportation to and from their resort, hotel entertainment, and the choice to have a Disney dining plan. Disney hotels provide you and your family with the true Disney experience, and there is a hotel for every budget! If you prefer to stay at a partner hotel, you will have access to some of the benefits of Disney hotels, but not all. To get to the park, there is a free shuttle service to and from each partner hotel. *Disney’s Davy Crockett Ranch is only accessible via car and is located slightly outside of the park area. If you plan on taking a day drip from Paris, don’t worry about the hotel! Take the RER A train to Marne-la-Vallée/Chessy and Disneyland Paris will be about a two minute walk from the stop. The trip on the RER A will take about 35 minutes and costs 7,10€. You can also access Disneyland Paris by car. It is about a 45 minute drive from Paris to Disneyland Paris. 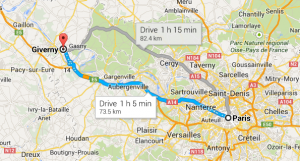 Take highway A4 and get off at Exit 14 : Val d’Europe, Park Disneyland. It is important to note that this is a very busy highway and oftentimes, there is a lot of traffic so your travel time might be longer. If you’re interested in driving to Disneyland Paris, rent a car from our partner Europcar and start driving! If you will be staying in one of Disneyland Paris’ hotels, you can take the Magical Shuttle Bus airport transfer from Charles de Gaulle and Orly airports directly to your hotel. It costs 20€ for Adults and 16€ for Children. Infants under 3 years old are free. You can book the shuttle up to 2 days before your arrival. Disneyland Paris ticket prices vary depending on the type of ticket you wish to purchase and the length of your stay. Child tickets cost less than Adult tickets. Ticket prices vary by dates, as well. There are 1 Day and Multi-day ticket purchasing options. 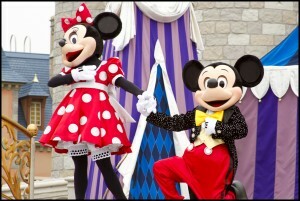 If you plan on spending more than one day at the Disney parks, then a Multi-day ticket package would be best for you. If you are only visiting Disneyland Paris for one day, the SUPER MAGIC Ticket 1 Day/ 2 Parks can be purchased for 84,00€ (approx. $115) for Adults and 77,00€ (approx. $105) for Children and it is valid for any day of the year (certain tickets have date restrictions). All tickets can be purchased online. Disneyland Paris is the perfect place to go with your family to take a break from everyday Parisian life during your stay in Paris.